스카이 섬, 스코틀랜드의 스카이 베이스캠프 | 호스텔월드에서 예약하세요. Skye Basecamp offers the perfect base for exploring the Isle of Skye. We've got beds in small shared dorms, private rooms and a self-catering apartment. Facilities at Skye Basecamp will particularly suit outdoor enthusiasts including walkers, climbers, paddlers and naturalists but everyone is welcome! We have hot power showers, comfy solid wooden beds with all bedding and linens provided, and a great drying room. 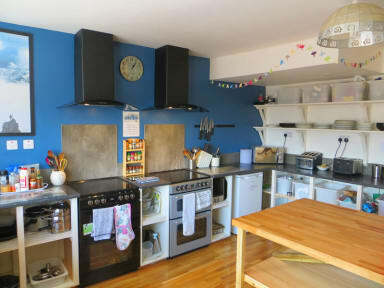 The large kitchen/diner is the hub of the hostel, with everything you need to create culinary masterpieces provided! The stunning view of Broadford Bay dominates the spacious and relaxing lounge, and there’s a pool table in the adjacent conservatory. Free wifi, storage and laundry facilities, and off-street parking is also available. Basecamp is owned and run by Skye Guides, the island’s biggest mountain guiding company, and guides and staff are always willing to share their in-depth knowledge of Skye and offer free advice on current mountain conditions and route details. The seaside village of Broadford is right on the main A87 road through Skye and only a 10 minute drive from the Skye Bridge. Occupying a quiet spot in the centre of the village, guests can enjoy an eclectic mix of shops, restaurants and pubs which are all just a two minute walk from our front door. A short walk to the beach might reward you with sightings of otters, seals and other wildlife commonly seen, and all of Skye's main sights and attractions are within an hours' drive. There is a bus top within 200m where buses servicing the rest of the island as well as Inverness, Glasgow and Edinburgh stop. If you wish to check-in outwith these times, please contact us directly. Reception opening hours vary seasonally. Reception: Summer (May – Oct) 8AM- NOON 4PM – 10PM, Winter (Nov – April) 9AM – NOON, 4PM – 9PM. If you expect to arrive for check-in outwith reception hours above, please let us know as soon as possible so we can make suitable arrangements. OVER 16s ONLY. 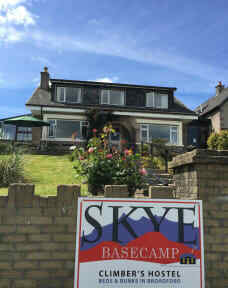 Children under the age of 16 are welcome at Skye Basecamp however strict conditions will apply. If you are travelling with children you must book an entire room. Children cannot be accommodated in rooms with guests outwith their own family. Please contact us if you wish to visit with children under the age of 16.